Portes Du Soleil is one of the largest ski regions in the world, connecting 12 ski resorts and 600 kilometers of skiing with 200 lifts, all on one ski pass. 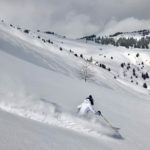 Its vast, beautiful, but can be confusing to navigate at first, with five separate trail maps and 300 prepared pistes. 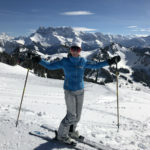 We skied Portes Du Soleil for two weeks, The Swiss and French sides. While most skiers are doing the circuit, skiing a tour around the region methodically, we preferred exploring each peak, and skiing off the PDS (Portes Du Soleil) tour. 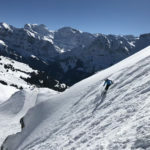 These are a few of our favorite trails, most of which are not on the Portes Du Soleil route, or circuit, making them far less crowded, and a real pleasure to ski with often better snow quality. 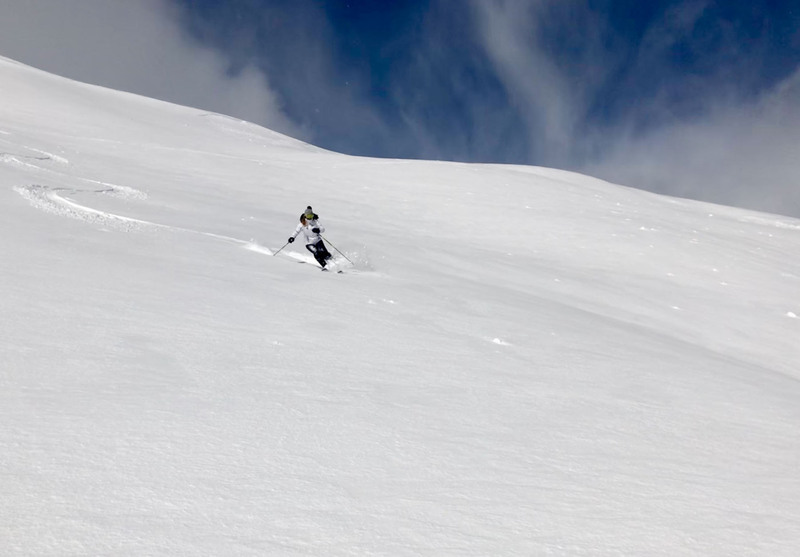 Champoussin has our favorite lifts and trails. 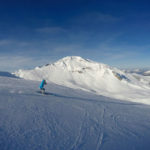 From TS Aiguille des Champeys quad chair, Trail 37 – Aiguille des Champeys, a premier steep black groomed trail (prepared almost nightly). With three steep pitches, it’s not for novices, though some end up here given its ease of access under the lift. East towards Les Crosets from Champoussin is TS Pointe de l’Au, another quad chair, often very windy at the top with a great view at 2152 meters. Red Trail #33 Pierrre a Cornieule is a red piste, gorgeous for cruising. 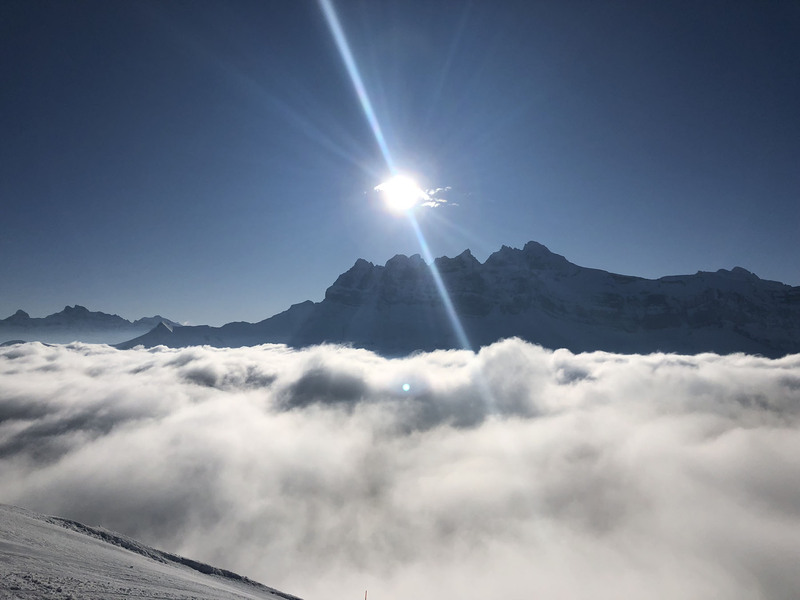 Almost always uncrowded, perfect fall line, great exposure for perfect snow and amazing views of the stunning Dents du Midi “teeth of noon”. 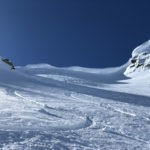 West or to the right of Champoussins TS Aiguille des Champeys, ride the Derrier Pertuis T-bar to reach Trail 41, Les Bochasses – a blue prepared trail, stay on it to the right of Chalet Les Bochasses and enjoy this long perfect fall line cruiser to the bottom of the high speed six-passenger TSD Les Bochasses in Morgin. 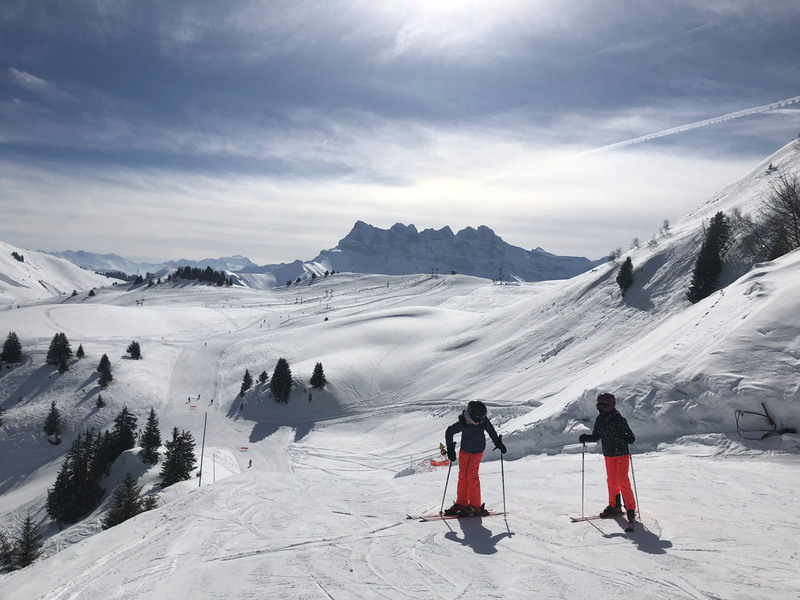 Right of TSD Les Bochasses six-pack is TS Chaux quad chair and Trail 43 – La Chaux – a fun red well pitched piste with a perfect fall line and more amazing views of the Dents du Midi. 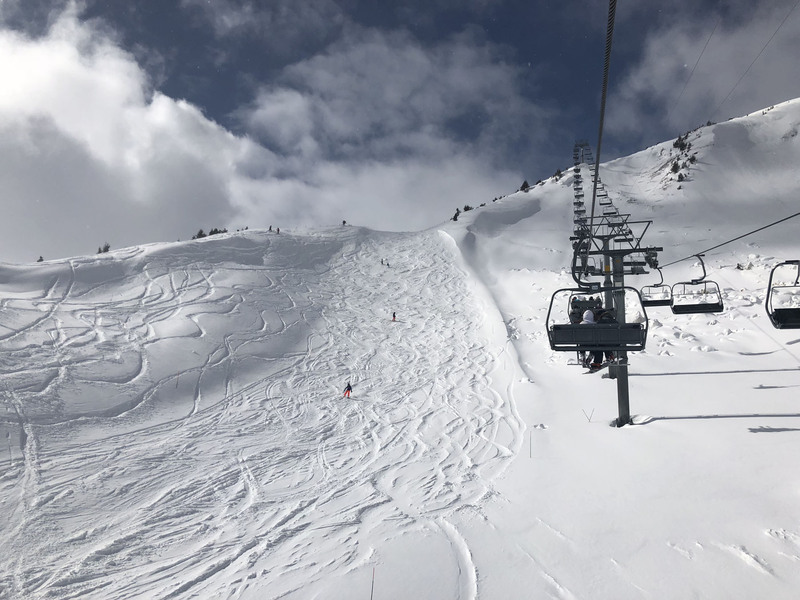 This piste is not on the touring route, so the groomed snow tends to stay fresh here all the way back down to the chairlift, next to U Yeu Tsalé, one of our favorite authentic mountain chalets. 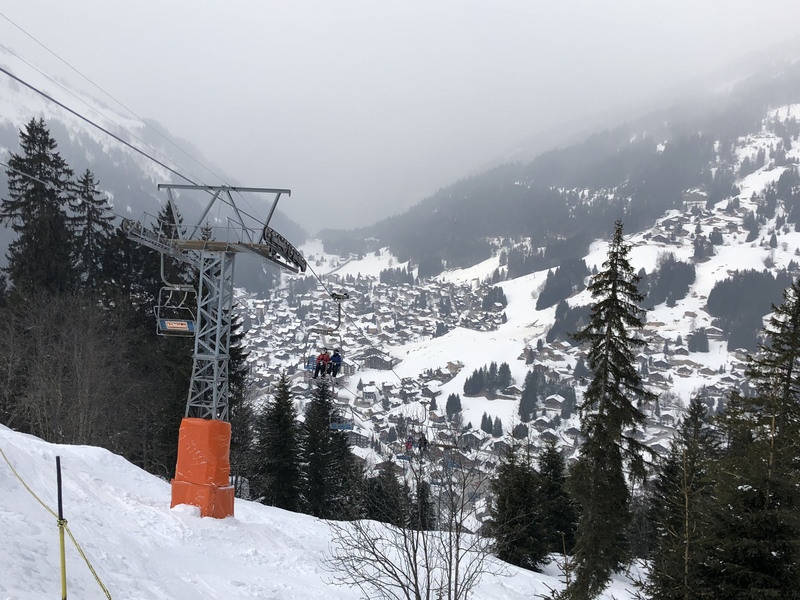 Top of Morgins, TS Chaux chair, drop down Trail 46 – Plan Joyeux is a joy to ski, a red piste that twists and turns, dropping into Morgins affording a great view of Morgins village as you pass under La Foilleuse triple chair, which eventually leads to the run out at the base. 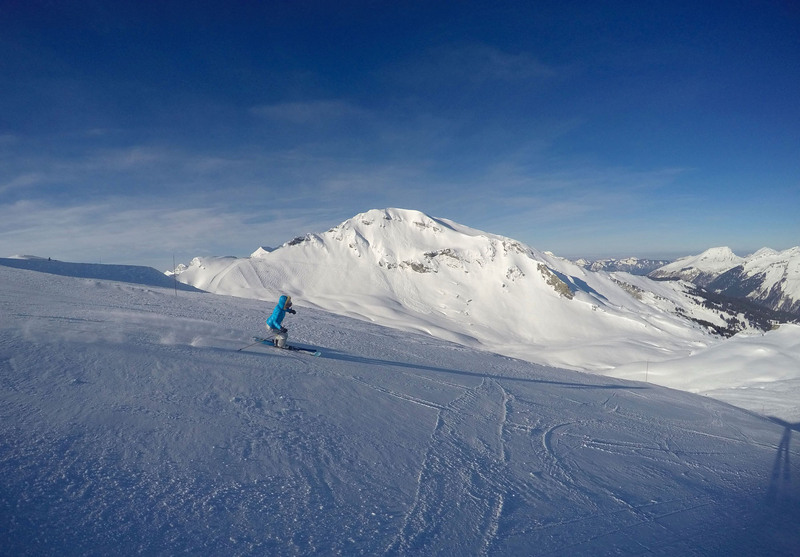 Les Croset ski village is a centrally located village on the Swiss side, a perfect place to stay at Mountain Lodge. 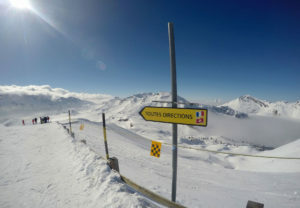 Two long high speed quads (Mossettes and Grand Conche) emanate from Les Crosets up to Pointe De Mossettes and the ridge, both offer several red and black pistes and one long easy blue, Grand Conche is a long trail offering great fall line, with plenty of off-piste opportunities between the trails. 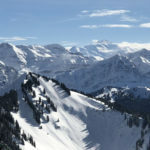 Champéry is furthest east, a pretty alpine village with a cable car up to its summit of Croix de Culet at 1962-meters. Off the fixed grip quad TS Pauvre Conche is Trail 18 – Pauvre Conche. 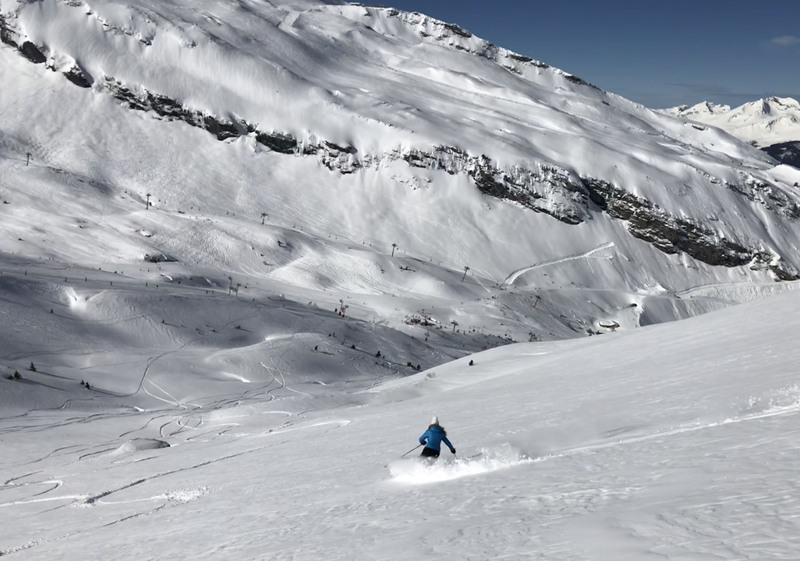 This fun black groomed piste is uncrowded and has good off piste options to skier’s right. 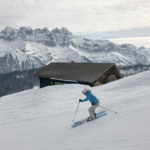 Still in Champéry, ride the TK Ripaille poma to the top of Pointe de Ripaille and drop down the long red Trail 11 – Ripaille Grand Paradis which skis you past two restaurants, classic Swiss chalets, before flattening out to a long several kilometer run out in this beautiful mountain valley, hence the name Grand Paradise. 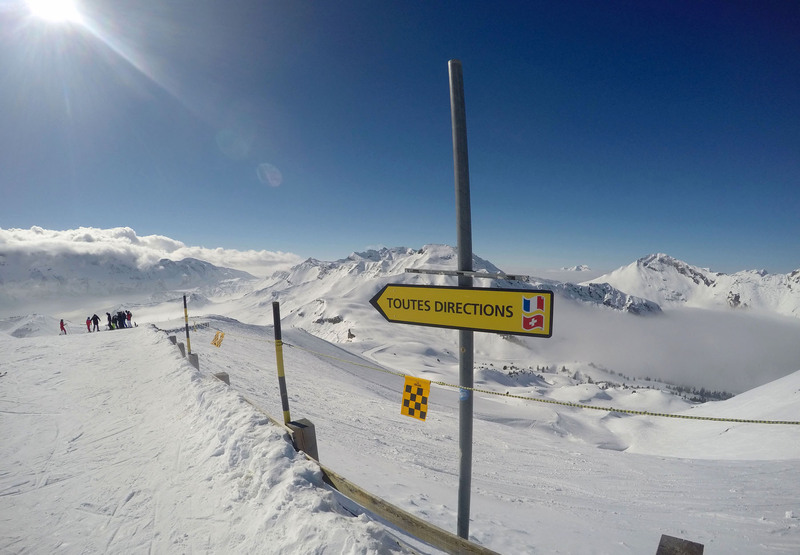 Skiing all the way down, you arrive at the TSD Grand Paradis chairlift taking you back to the top. 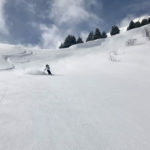 You should avoid this run on warm afternoons and snowboarders maybe best advised to almost always avoid it. 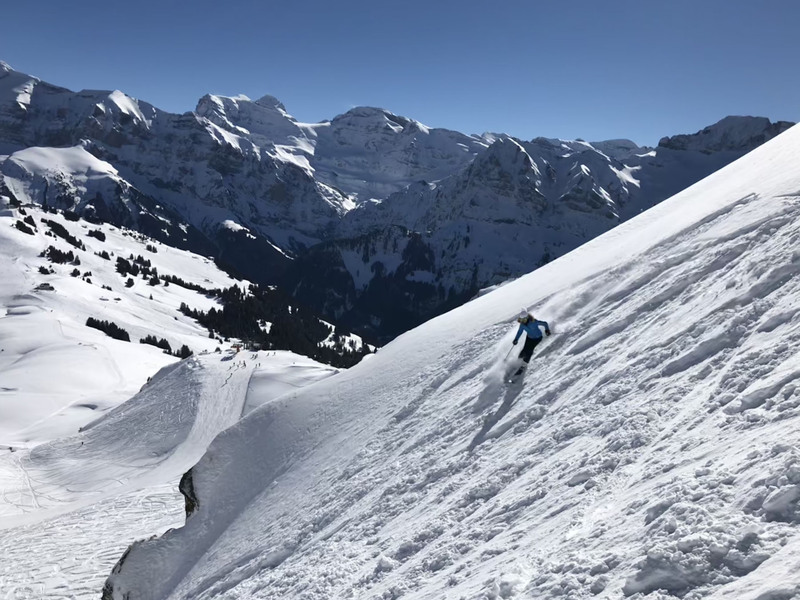 Champéry is also home to the famous Swiss Wall, aka Trails 12 Chavanette, on the other side of the valley, ride lift TS Chavanette to the summit of Pas de Chavanette, for a firsthand view before you attempt the Swiss Wall, labeled yellow – never groomed – the biggest steep bump field you will ever find. 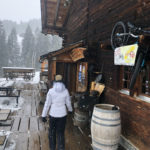 At the top, 2,150 meters, is O’Padcha Chalet restaurant for a cappuccino of courage before you drop down the Swiss Wall (the signs say don’t fall – so don’t actually drop) or ski to the French side. 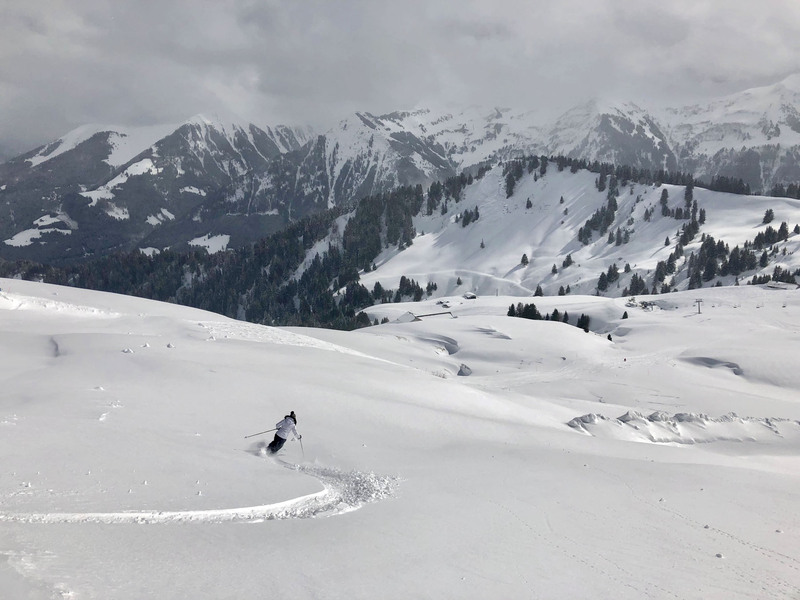 Longest run in Portes Du Soleil, from the summit of Pointe De Mossettes, is ski Trail 31, Tovassière, after a lovely pitch of several kilometers, you will arrive at La Tovassière chalet restaurant in a beautiful valley. After lunch, a cappuccino or aperitif here, the trail flattens out for a long 5-kilimeter run out to the village of Morgins. 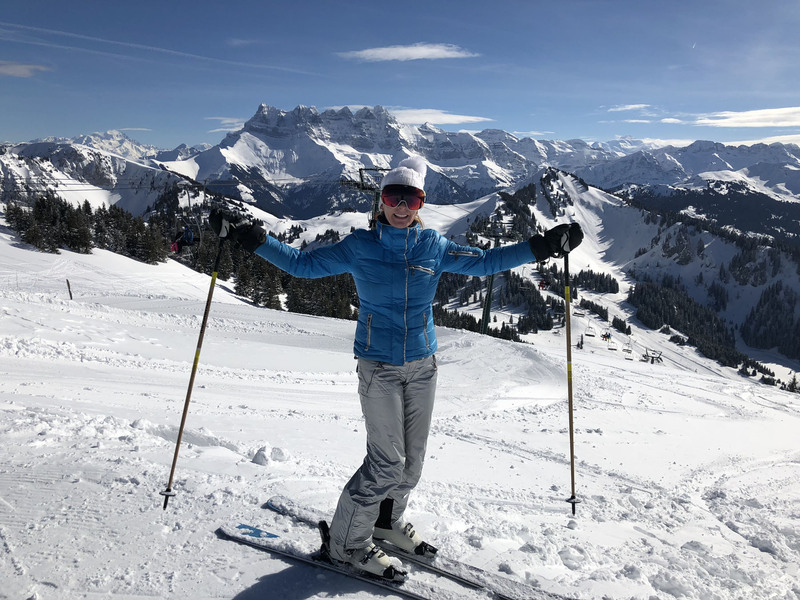 At the summit of Swiss Pointe de l’Au, descend black Trail 35, named Didier Defago – honoring the famous Swiss ski racer who won the Kitzbühel’s Hahnenkamm in 2009 and the Vancouver Olympic Downhill. 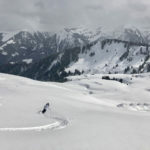 After a few kilometers of perfect pitch – this trail joins the Tovassière run out, Trail 31, to Morgins where you can ride the triple La Foilleuse chair toward Champoussin or catch the bus across the village toward Châtel and Torgon. 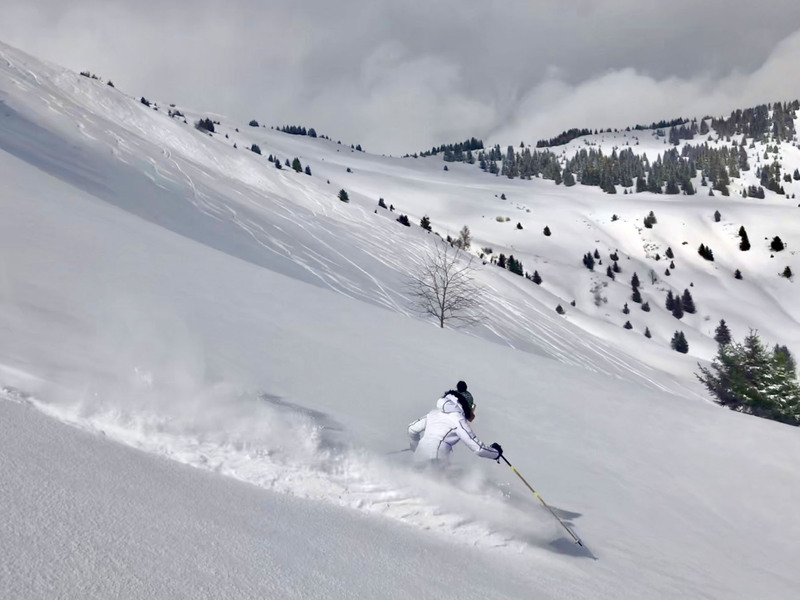 We love Champoussin skiing on the Swiss side best, with two fixed grip quads and a few drag lifts, its far less crowded than any other region, and in addition to the great trails, there’s tons of off-piste, including low angle pastures, hence the name Champoussin – chick field. 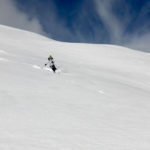 But be wary of avalanche on the steeper more prone pitches. 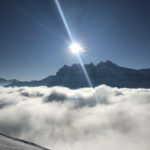 The Dents Du Midi views are exceptional in Champoussin as well, and the chalet restaurants are charming. 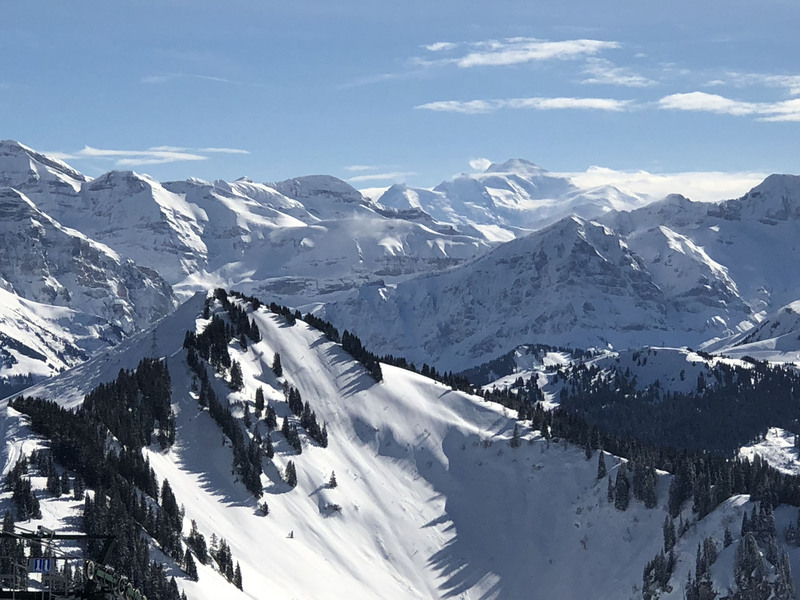 On the France side of Portes Du Soleil, here are a few of our favorite ski trails and best plan for skiing. 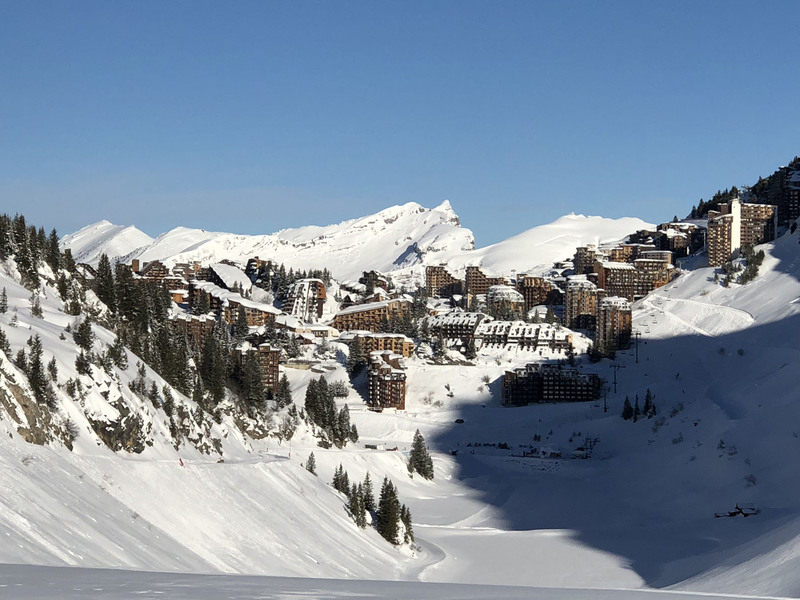 Avoriaz offers two major valleys of skiing, separated by its large, very built up mountain lodging town on a high plateau. Marvel at how these towering condos are perched on cliffs, built in the 1960s. 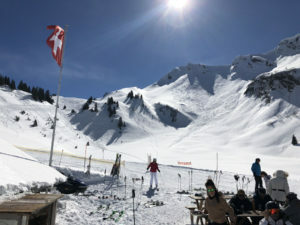 From Pointe de Mossette quad, the Swiss border at 2277 meters, ski the long Abricoti blue trail into the French valley (warning, this trail can get very crowded and you need to get some speed before the 3 separate flat areas). 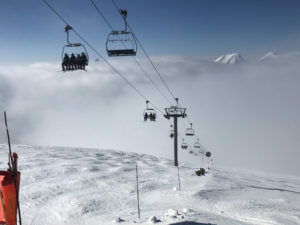 The French side does not always mark numbers on their trails, but they occasionally offer a numerical count down as you descend, probably for white out days. 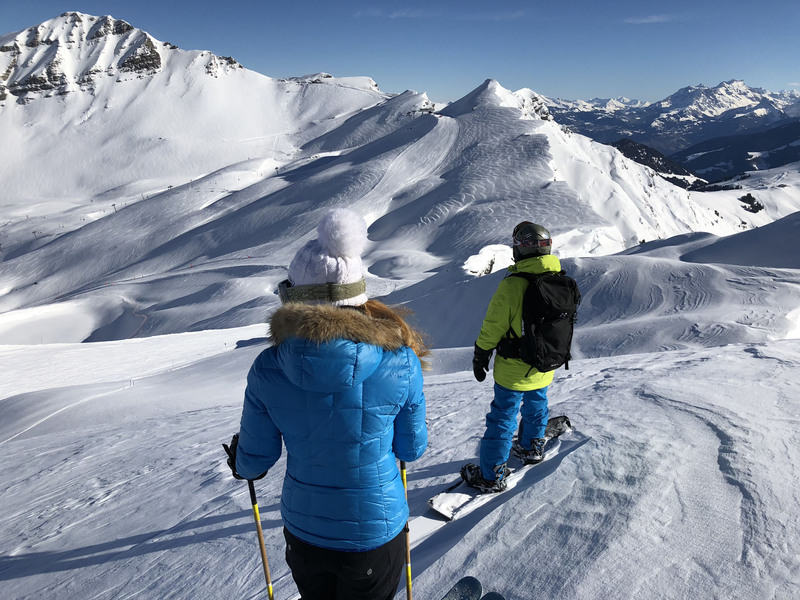 At the base of the TSD Mossette quad, return to the Swiss side, or jump on the TSD Brochaux 6 pack and enjoy Blue Velvet – a blue piste, or explore Burton’s Stash terrain park (which despite its name is very easily found and super popular with kids, ski school and free riders). TC Ardent gondola into the village should only be accessed for two reasons: 1. you parked there, or 2. you want to lunch at one of the lovely chalets in Villages du Chevres or Les Lindarets, you will need to ski down the base and ride the Ardent gondola back up where you have a choice of four lifts in Avoriaz one of which leads you to Châtel’s terrain, and some fun ski bars on a sunny day. 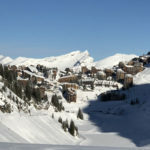 Ride the Prolays, Lindarets or Brochaux or to ski through the busy Avoriaz village to the other valley. Our favorite run in this eastern Avoriaz region was Jean Vaurnet, a long red piste named for the French ski racer and later, sunglass designer, from TSD Lac Intrêts or TSD Grand Combes. 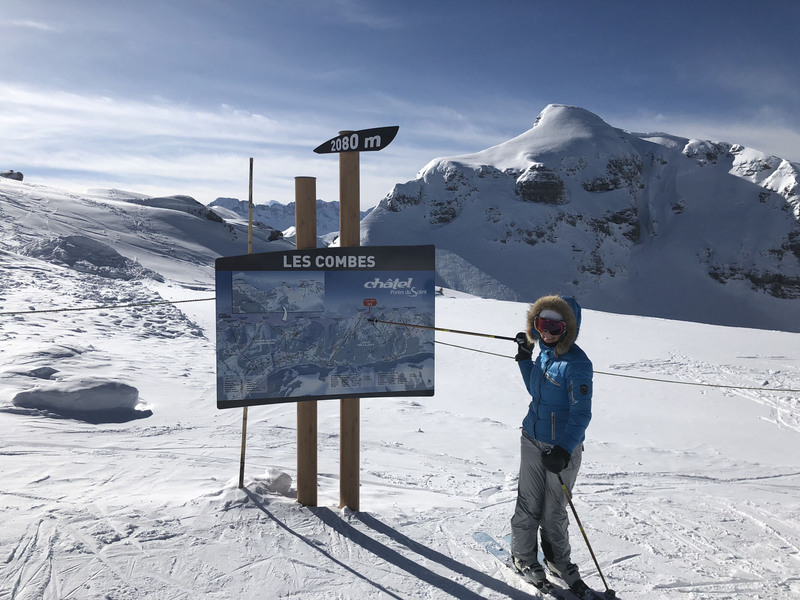 Snow Cross Crozats offers an extremely long sometimes very steep ungroomed run all the way to Les Prodaines gondola, home of Chilly Powder Au Coin De Feu – a lovely family-oriented mountain lodge. 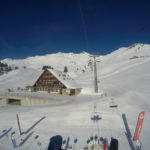 Les Prodains is also the best place to catch the 10-minute bus to Morzines and Les Gets villages of Portes Du Soleil. 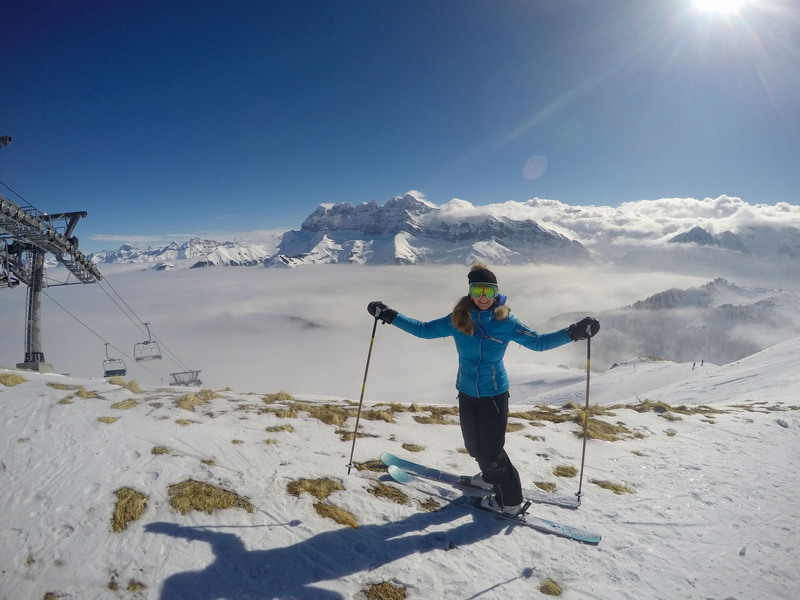 TSD Fornet chair, above Avoriaz village, offers great off-piste style skiing including SnowCross Pschott or Snow Cross Marmotte. Snowcross means marked route that is not prepared (not groomed). 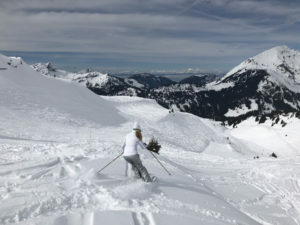 In Avoriaz ride the TSD Chaux Fleurie, and ski to the next valley, Châtel. 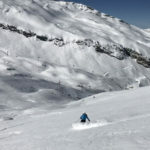 Seek Trail 37 La Casse Noisette – a nice steep groomed cruiser, down to the Pre de Pierre Longue, an aptly named long chair lift to Plaine Dranse, a restaurant village with half a dozen chalets for lunch or drink. 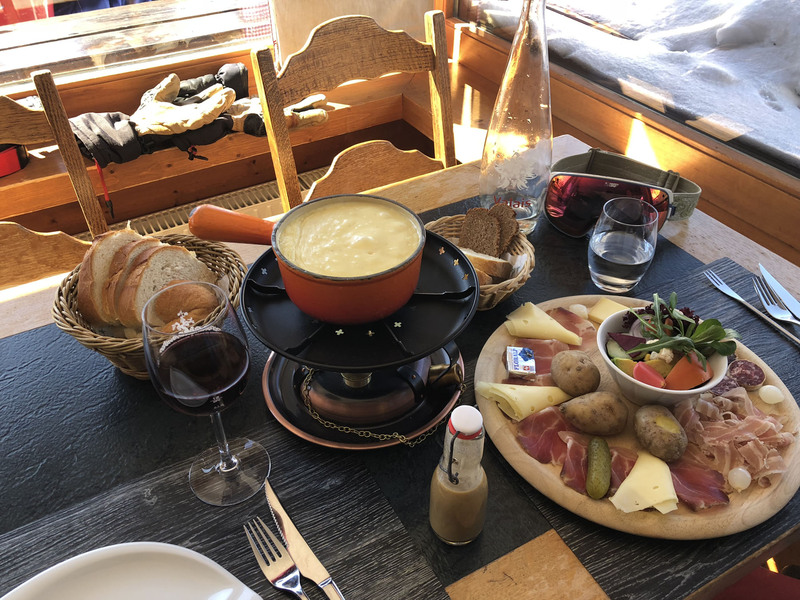 We loved Chez Denis – the highest and most authentic, literally above the rest. 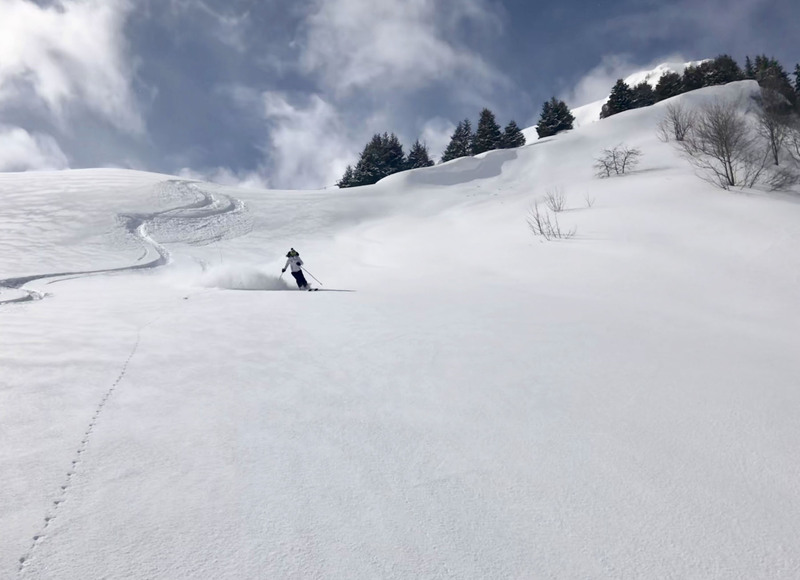 Châtel’s TSD Cornebois lift brings you to Trail 30 La Pedrix Blanche – a nice long red trail, a little less crowded than other pistes in popular Châtel – which is two large ski regions, connected by two long modern transfer quad lifts – Gabelu and Portes Du Soleil. 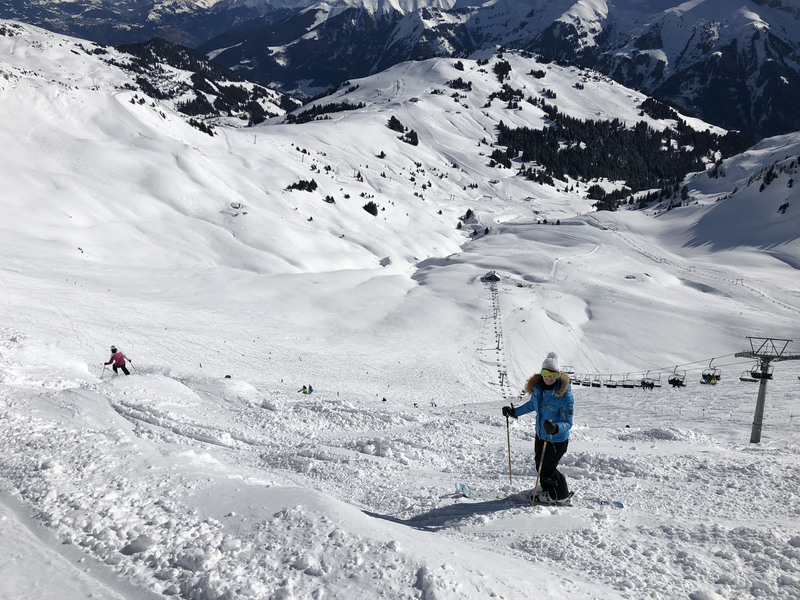 We enjoyed skiing Châtel and Super Châtel, including the gentle rolling off-piste in happy valley, but found the terrain very busy. We didn’t dare zip-line L’envol Fantasticable – departing from La Rochassons lift, this wild zip spans 1200-meters flying at 100 kmh. 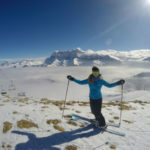 Note about Avoriaz and Chatel: the pistes (trails) and lift lines here are far more dramatic, busy, than the Swiss side, as there is so much more lodging and therefore skiers in Avoriaz and Châtel. 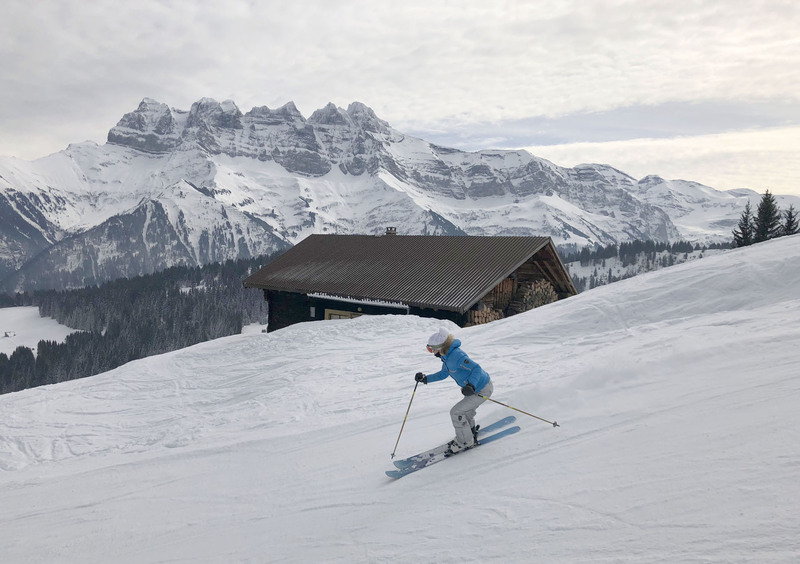 Super Châtel borders Torgon – back on the Swiss side, we loved breaking away from the pack and the hustle of the circuit by skiing toward Torgon. The view of Mont Blanc and the entire region is magnificent. Unfortunately Torgon lost a few key lifts in recent years, so if you are lodging in the village of Torgon, at La Jorrette, you must take a free bus to the ski slopes, However for day skiers, you can pass through Torgon and enjoy beautiful trails, many pomas and a few chairs, accessing high plateau skiing and unlimited off piste terrain (hire a guide to explore safely). 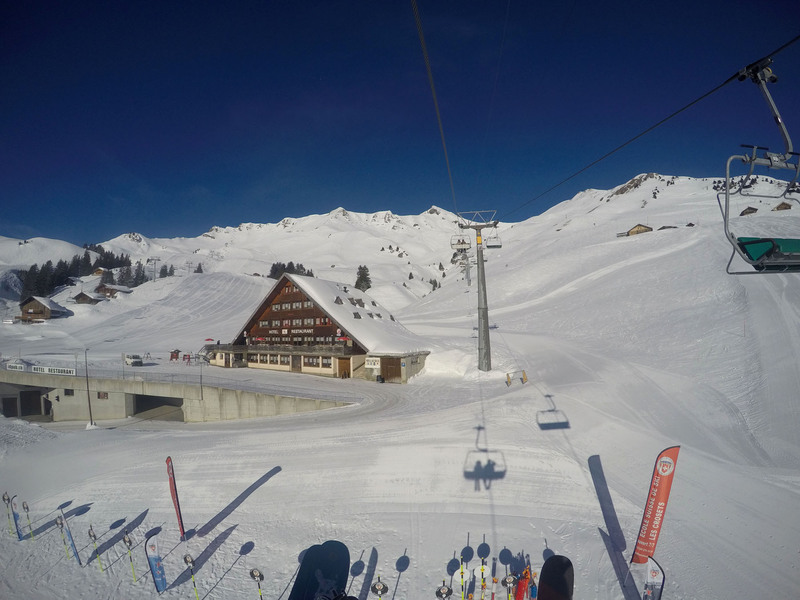 If you are touring from Torgon to Morgins, expect a series of long aging drag lifts. 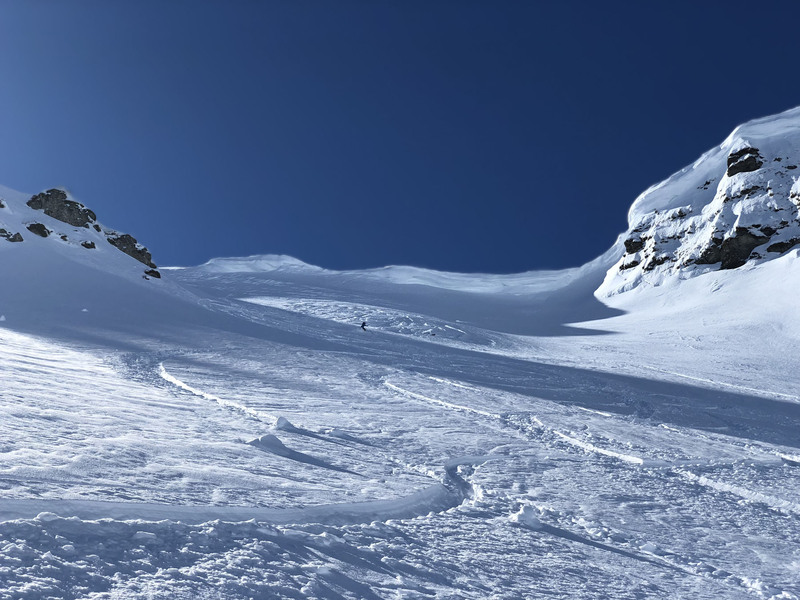 Atop Tour De Don, at 1942 meters, there’s some very tame terrain with spectacular vistas of the region, Dents Du Midi, Mont Blanc, the French Alps, and excellent snow quality given the lack of pitch on this high alpine plateau. 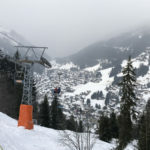 Morzine and Les Gets, we only skied here one day in fog, so this is not a complete review. 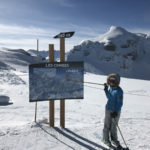 We took the 10 minute free bus from Les Prodaines, Morzine and Les Gets are lower elevation (2019-meters max), so these two connected ski regions do not receive as much natural snow. A large variety of high speed lifts lead us to believe this is a popular region to ski, with interesting trails, much below tree line. The village of Morzine is bustling and traditional, lots of chalet boutiques cafes, bars and lodging, Looks like a fun place to stay, near the Pleney gondola. 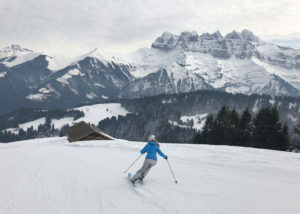 Morzine’s Chamossier Express and Le Ranfoilly both serve fun intermediate and advanced ski trails. 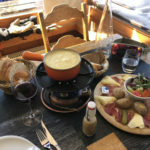 We had an amazing lunch at the cozy Chez Nannon in Morzine, near the top of the Troncs Express. 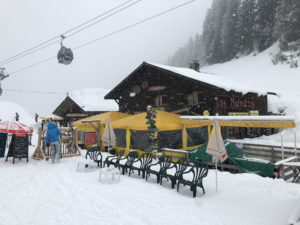 Make reservations if you ski Morzine at this top chalet restaurants in Portes Du Soleil. “Falais” Yellow Exclamation Sign – Cliff – Don’t Do It! Trail Side Markers: Often the left side trail marker had a shorter colored top, right side had a longer colored marking – typically the color of the trail difficulty, but sometimes just bright orange or yellow on top. 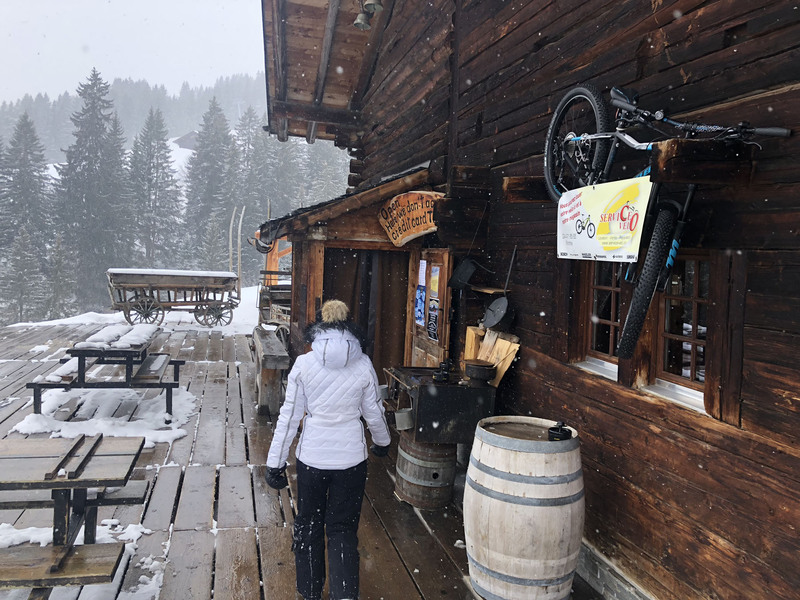 This becomes important when its white out, so you know which side of the trail you are on, and don’t drop off the groomed slope.